LAS VEGAS, May 4, 2017 /PRNewswire/ -- Jive Software, Inc. (Nasdaq: JIVE) announced its five elite Digital Transformation Award winners at the conclusion of JiveWorld17, the industry's premier conference for enterprise collaboration. 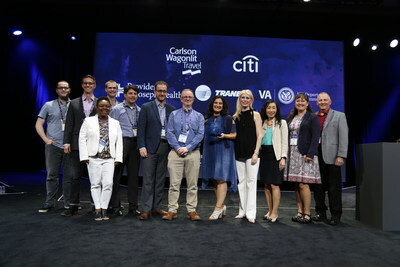 This year's 'Jive 5' distinction honored Carlson Wagonlit Travel, Citi, Providence St. Joseph Health, Trane and the U.S. Department of Veterans Affairs for their outstanding achievements in engaging employees, customers and partners via the Jive Interactive Intranet and Customer Community solutions. Nominations for the annual Jive Awards program were submitted by customers and JiveWorks community members. A panel of judges comprised of industry thought leaders, previous award winners and Jive senior leadership selected the twenty-five award winners, which also included ADP, Akamai, Allscripts, Bluegreen Vacations, Commvault, Driven Brands, Euroclear, Grant Thornton UK, Hitachi Data Systems, Humana, Leidos, Medidata Solutions, Royal Australian College of General Practitioners, Royal Bank of Canada, Standard Chartered Bank, Starwood Hotels, Truth Initiative, Viavi Solutions and Western Digital. JiveWorld17 offered more than 60 customer-led breakout sessions on best practices in optimizing employee, customer and partner connections and driving stronger communities for measurable business outcomes. Presentations included speakers from Dell, DISH, McGraw-Hill Education, NASA, Pearson, Telefónica Germany, T-Mobile, the U.S. Army and Verizon. For more information, follow @JiveSoftware or #JiveWorld17 on Twitter, and for the complete list of JiveWorld17 news, please visit the Jive Software News Room.